The diagram above is a representation of the agile test pyramid concept that was initially designed by Mike Cohn in his book “Succeeding with Agile”. The concept describes the recommended proportions of tests to be implemented for an application on each layer of the test pyramid. Unit tests and OPA5 tests are much faster and stable compared to system tests. Faster tests give faster feedback that allows to catch issues on an early stage, especially if they are part of a continuous integration pipeline . In contrast to System tests which are more fragile, difficult to maintain and which must be adapted more often, Unit and Component tests are easier to handle because they are running in an isolated context. They run independently and exhaustively, which eases the root cause analysis and thus saves a lot of costly evaluation time . 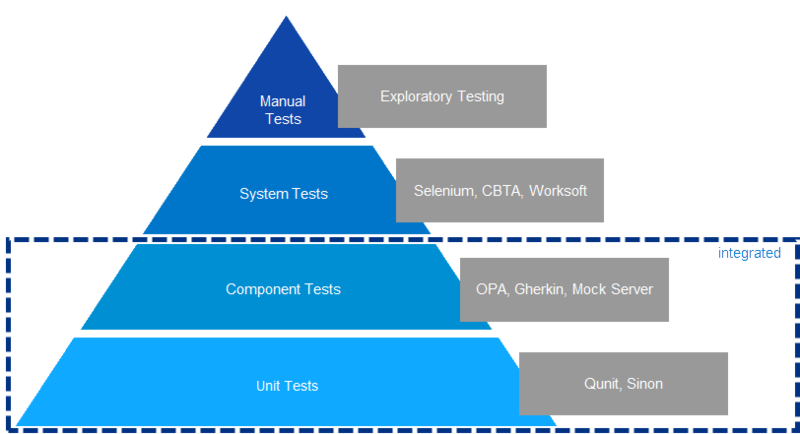 OPA5 belongs to the component test layer of the test pyramid and benefits from the advantages of fast feedback and low costs. Writing OPA5 tests seems complicated at first but if you follow some best practices and guidelines you’ll see that your tests become much more stable and less fragile. And having the tests continuously and frequently running in your continuous integration pipeline will give you reliable, fast and precise feedback about the internal quality of your app. SAP Web IDE offers commands to help you quickly create skeleton OPA Pages and OPA Journeys. 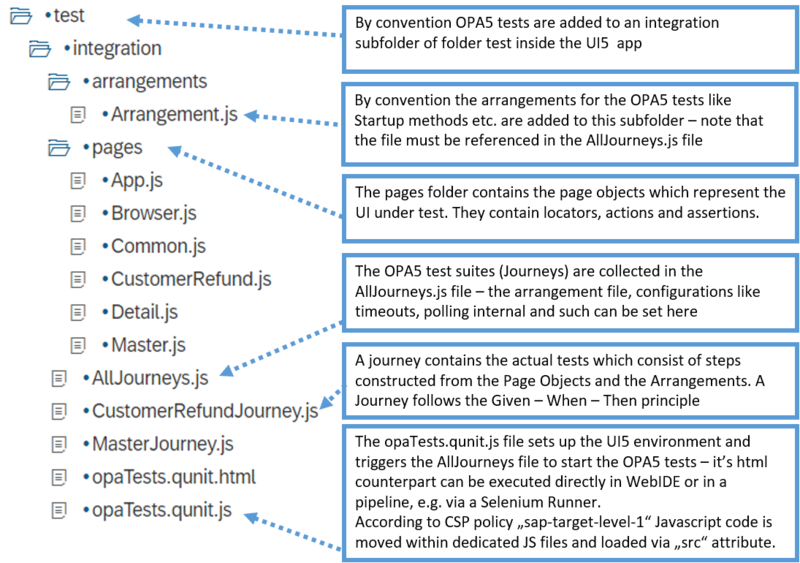 Beside the templates you can use new code completions in SAP WebIDE to create a skeleton for OPA actions, OPA assertions in OPA Pages or a new OPA test in your OPA Journeys. errorMessage: "Was not able to find the control with id commentArea"
Locating elements via stable Ids is always recommended because they are the safest locator option and you will never have a problem with finding more than one element. Ids are usually designed to be unique, therefore this locator strategy is more reliable and makes tests more robust. If no stable id is available, you need to find a different solution. In this case you should use stable OPA5 matchers like I18NText, BindingPath or LabelFor. errorMessage: "Did not find a title with i18n key \"openBaseSet\""
errorMessage: "The binding path for selected item was not matched"
errorMessage: "Failed to fulfill Name input"
Using OPA5 action instead of writing own success function code ensures that the UI is interactable when an action is executed and subsequent events are triggered. errorMessage: "Could not find input idGroupInput"
Below screenshot shows how the test results look like when starting your OPA5 tests in UI Component mode instead of within an iFrame. In this case your UI Component will run in the same window as your OPA5 Tests. Further details about OPA startup by using UI Component can be found here. We recommend to use the default timeouts and polling intervals. Further you should set autoWait: true in the OPA5 config settings in the AllJourney.js file. We recommend you to overwrite the default settings for individual waitFor calls only if necessary. errorMessage: "The message toast did not show up"
Another sample is in case you want to add an assertion to check that a button is disabled. As mentioned before we recommend you to set autoWait to true in the config settings. As a consequence the button is not found by your waitFor statement as the autoWait property ensures that only interactable elements are considered in the locator results. If you want to find the disabled button you have to set autoWait explicitely to false for this specific waitFor statement as shown in the code snippet below. errorMessage: "The disabled button cannot be found"
If a regular expression and a viewName are provided, OPA5 will only look for controls in the view with a matching ID. Here we identify “Fluffy Teddy Bear” in the table by title using RegExp. Example has been taken from BulletinBoard app in SAPUI5 Demo Apps. // text start with "Peer Groups"
errorMessage: "Could not find Teddy Bear in the list"
We hope that this blog post is helpful to you. If you have further ideas or best practices that you would like to share please add in comments section below. OK – now I am going through like 100 blogs. (maybe not that many) One of the things I read was not to have both SAP Web IDE and UI5 in use. It causes issues. So same question, different blog. Since you nicely provided links to both IU5 and Web IDE. What do you recommend UI5 or SAP Web IDE? We recommend you to use the SAP Web IDE as development environment to develop your apps with the SAP UI5 framework. The main advantages in regards to component testing with OPA5 are the predefined templates and code completion that eases the creation of QUnit and OPA5 tests. Further you can easily run your OPA5 tests directly from SAP Web IDE with just one click. Thank you for taking the time to write the blog and answer my very simple question. I’m just starting on this journey. I’ll check out the links. I think I’ve download a lot of software that I’ll never use. But since you are the second one to verify SAP Web IDE. I’m gong to start there. I also am excited to have a way to set up code tests!